An electric car is plugged into a charging station at Lansdowne Mall in Peterborough, Ont. A decade-old goal to get at least half a million electric cars on Canada’s roads by the end of 2018 appears to have missed the mark by more than 400,000. The 2009 Electric Vehicle Technology Road Map for Canada, produced by a panel of experts in part for the Department of Natural Resources, aimed for 500,000 cars with the hope of galvanizing industry to make and sell them and government to encourage people to buy them. Data compiled by FleetCarma, which tracks electric-vehicle sales each quarter, suggests that by the end of 2018, the actual number was fewer than 100,000. The report warned the electric-vehicle train was already leaving the station and Canada wasn’t on it. It outlined things the government and the private sector should do to ensure Canada didn’t miss out on the economic and environmental benefits of an electric-vehicle industry. A major element was the need to co-ordinate existing work on electric vehicles in Canada among auto manufacturers and parts companies, research facilities and consulting firms, and ensure a more cohesive industry. Public-awareness programs, investments in infrastructure, and work with electricity companies were also needed. “What we have been lacking is any kind of national plan to deploy electric vehicles and attract capital and compete to serve the demand for electric cars,” said Dan Woynillowicz, policy director at Clean Energy Canada. The Liberals in 2016 promised a national strategy for electric vehicles by the end of 2018. Thus far they haven’t delivered and a spokeswoman for Transport Minister Marc Garneau says she can’t say when it will come. In the last three years the federal government has spent $182 million to buy and install more vehicle-charging stations. Bob Oliver, chief executive officer at Tech-K.O. which helps clients market their electric-vehicle technologies, was part of the panel that produced the road map. He said the 500,000-vehicle goal was not a prediction, but an aspiration. 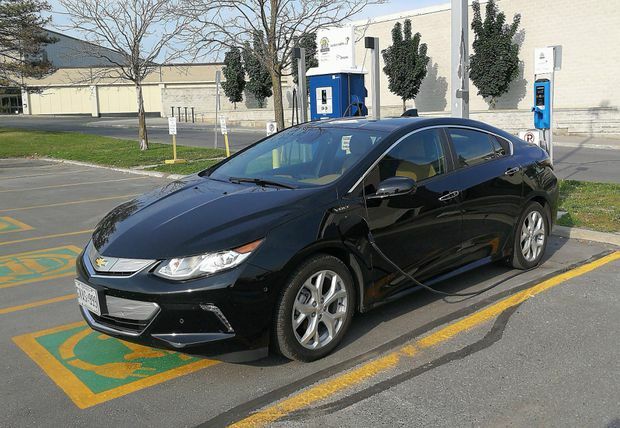 Ontario, Quebec and British Columbia accounted for 97 per cent of all the plug-in vehicles sold in Canada between 2013 and 2018. Many of the other provinces have very few public charging stations, which is one of the biggest barriers to public confidence in buying a plug-in car – potential purchasers worry about running out of juice and having nowhere to charge up. Quebec now has a quota system to require auto dealers to sell a minimum percentage of electric cars or pay a penalty. British Columbia in November expanded its zero-emission-vehicle policy to say that no gas cars can be sold in B.C. after 2040. Nine countries, including France, the United Kingdom and Norway, have plans to phase out some or all gas-powered vehicles between 2025 and 2050. Canada signed on to a new international alliance to drive a switch to electric cars when ministers and officials met in Poland for the most recent United Nations climate-change talks. Oliver said a Canadian preference for bigger vehicles like SUVs and pickup trucks is one of the barriers to electric-car sales here. There are almost 23 million passenger cars, SUVs and pickup trucks registered in Canada, and Canadians in the last decade have increased their interest in the SUV and truck side of the business. About two-thirds of vehicles sold in Canada today are in those categories and they include virtually no electric models.